My name is Sarah Jones, and I head up the geomatics team at MOLA (Museum of London Archaeology). On a daily basis I deal with all kinds of high-quality survey, spatial, and location data recording the many historic buildings and archaeological sites we work with. My interest in historic maps and the fascinating insights they hold extends beyond my day job: as a child, I switched from saving my pocket money to buy plastic sheep for my Britain’s toy farm, to buying my first copperplate historic map. So naturally I was thrilled when, 2 years ago, the MOLA geomatics team were asked by Layers of London to ‘georectify’ the 9 ‘great’ historic maps which would form the base onto which the project’s many wonderful memories, landmarks, events, and stories collected from across London would be pinned. This formidable but rewarding task has involved taking geographically-inaccurate maps (many of which are more like historic art objects from the early days of map-surveying) and bringing them up to modern standards by pulling them around in a GIS (Geographic Information System). This allows them to be lined up, one on top of the other, over an OS map base. Each map came with its own unique set of challenges (more of which I explore on the MOLA blog), but perhaps none more so than Faithorne & Newcourt. 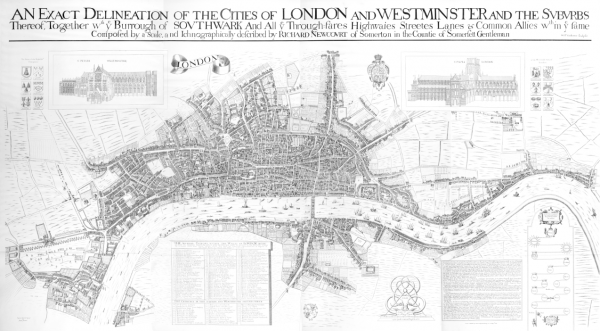 Published in 1658, it depicts London a few years before it was devastated by Great Fire of London. It now stands as a haunting premonition of things to come, showing the dangerously clustered houses and narrow streets of medieval London. We encountered a tricky problem when we began work on the Faithorne & Newcourt map: Lambeth Palace is represented so far north of where it should be in reality that the map image became completely illegible when we tried to georectify it! This dramatic survey error probably stems from the barriers posed by the swampy marshes of Lambeth, and of surveying across the River Thames. Newcourt and his colleagues were only equipped with simple theodolites and compasses to measure angles, and used triangulation from high vantage points. Distance could only be measured on the ground by metal chains, or calculated through trigonometry. As a result, accurately measuring the Lambeth area without any high points of reference nearby to help would have been nearly impossible. Our solution was to cut and paste Lambeth southwards closer to where it should have been, on the GIS image – the only instance throughout the project where we were forced to alter the map graphic itself; a great testament to the skills of our early London surveyors, and also of London’s importance as a centre for early survey instrument-making. 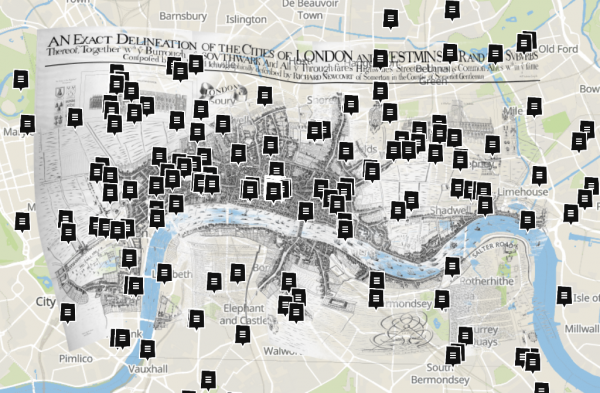 Find out more about MOLA and the challenges they overcame to georectify London’s historic maps on the MOLA blog.